When Padme was little, every Sunday after church we would go to Panera for Broccoli Cheddar Soup served in a bread bowl. Artoo would get a ginormous orange scone and devour it. I would usually opt for a topped-with-something-bagel and the accompanying flavored-into-oblivion cream cheese, and Lando would enjoy an Asiago Cheese bagel. Ahhhhh, Panera. Eventually they put in a Chipotle by the Panera and when Artoo needed to go gluten-free, he was content to sit with a giant helping of spicy chicken while we ate our baked goods. Chipotle and Panera. Life was good. I seem to have the lost my way in this post. It was supposed to be about the broccoli soup. And it will be. Because Broccoli Soup really is easy to make. Sounds pretty Brainless to me. But not filling. 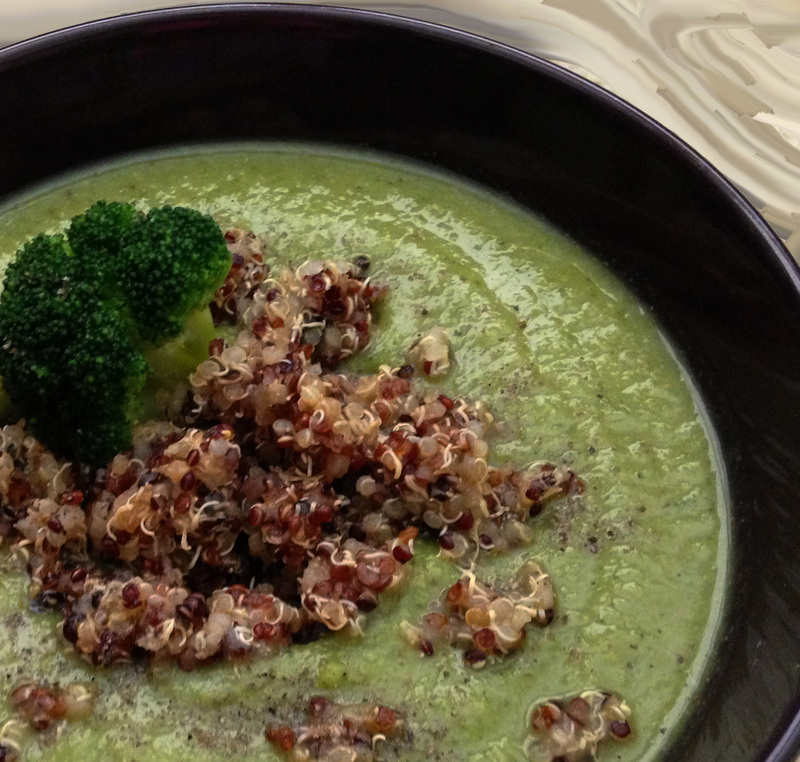 How about “Cream” of Broccoli Soup with Quinoa and Farinata. You know, I don’t give up very easy. About anything, especially about driving through somewhere and feeding your family who-knows-what out of convenience, when with a little bit of prepwork, you can have a meal on the table in minutes. So, let’s all play nice and read. Or look. Completely edible. Just new. That’s all. It’s good to try new things. It’s good to learn about new things as well. Farinata is Italian street food. No, not like hot dogs of dubious ingredients in New York. Or delicacies-of-unknown-origin-on-a-stick in China. Farinata, according to Wikipedia (which is always right) is:”……the dish is called “farinata” ‘made of flour’; in Ligurian……In Nice and the Côte d’Azur, it is called “socca”, and in Tuscany, “cecina” ‘made of chickpeas’……It is made by stirring chickpea flour into a mixture of water and olive oil to form a loose batter, and baking it in the open oven….Farinata may be seasoned with fresh rosemary, pepper and sea salt. Traditionally farinata is cut into irregularly shaped triangular slices, and eaten (with no toppings) on small plates with optional black pepper. Elsewhere in Italy….it is served stuffed into small focaccia (mainly in Pisa) or between two slices of bread, as it is traditional in Livorno. It is sold in pizzerias and bakeries.”. So there you go. And no, I will not be placing it between two pieces of bread. Padme would require a trip to the ER for so many carbs. And I do not have time for that. I can tell you one thing, you have time for this dish. It is fabulously easy, very tasty, and a great “blank” canvas for just about any topping you can imagine! 1. In a large stockpot, heat broth and water to boiling. 2. When boiling, add frozen broccoli and spices and reduce heat so soup simmers for 15 minutes. 3. Remove from heat, pour in “milk” and allow to cool. 4. When mixture is COOL, puree with a handblender until smooth. Do not do this when the mixture is hot, or even warm. It may burn you. 5. Will keep in refrigerator for 2-3 days. 6. If desired, cook 1 cup of quinoa as directed on package. Quinoa used in hot dishes tastes its best being cooked and served on the same day. Add to the soup just before serving. *Helpful hint from Heloise: A few spoonfuls of bacon grease stirred into this right before serving, and a sprinkle of smoked salt take this soup to a new level of goodness! Adapted from Mark Bittman’s “How To Cook Everything Vegetarian”. Which you should really own, it is a tremendously helpful book. A cast iron skillet is the very best to use here, or a pie plate will work. 2. If you are using a cast iron skillet, liberally grease the bottom. 3. Mix the water, oil, spices, and flour together. Whisk until there aren’t any lumps. Then whisk some more. Really. This can now set on the counter for anywhere from 15 minutes to an hour. 4. When you are ready to bake this, place your cast iron skillet in the oven for 10 minutes to preheat. If you are not using a cast iron skillet, do NOT place your empty pan in the oven. Just go to the next step. 5. When mixture is slightly thickened, pour it into your pan. I garnished mine with tomatos for some contrast. 6. Bake for 20-25 minutes, depending on your oven. A toothpick inserted in the middle should come out clean. 7. Let cool, slice and serve! 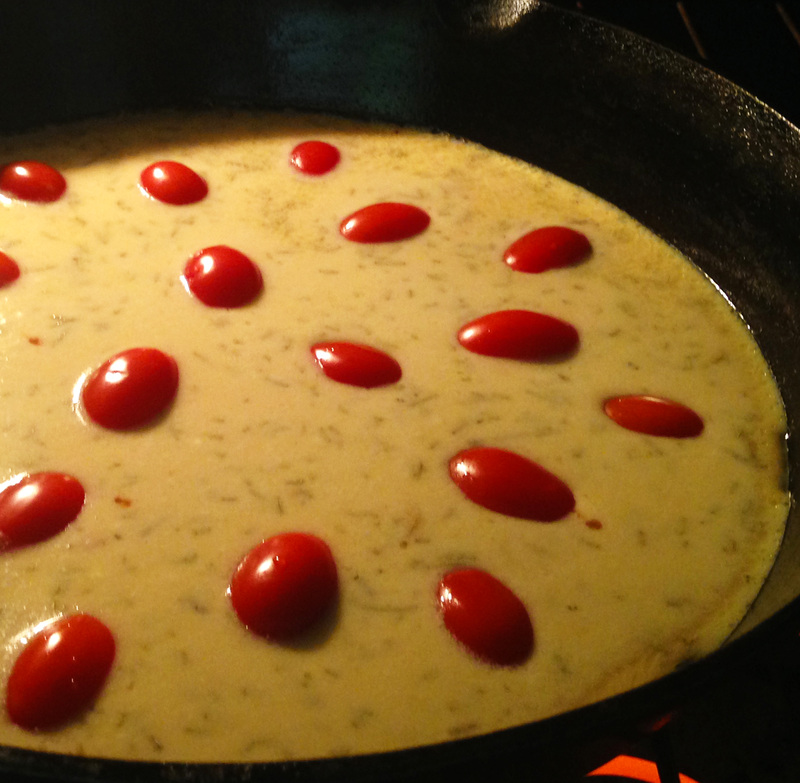 Toss a salad, ladle up some broccoli soup and a slice of farinata! This also travels really well in lunchboxes! I’m not done with Farinata yet – don’t worry! 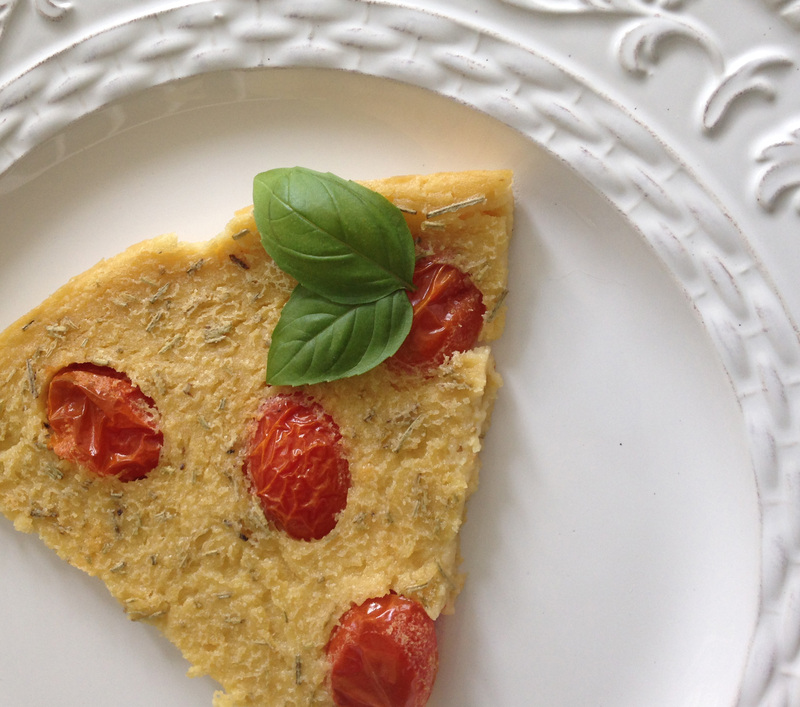 A farinata/eggless frittata will be coming soon! Another Brainless Monday Meal (TM) in the kitchen is done early in the weekend!